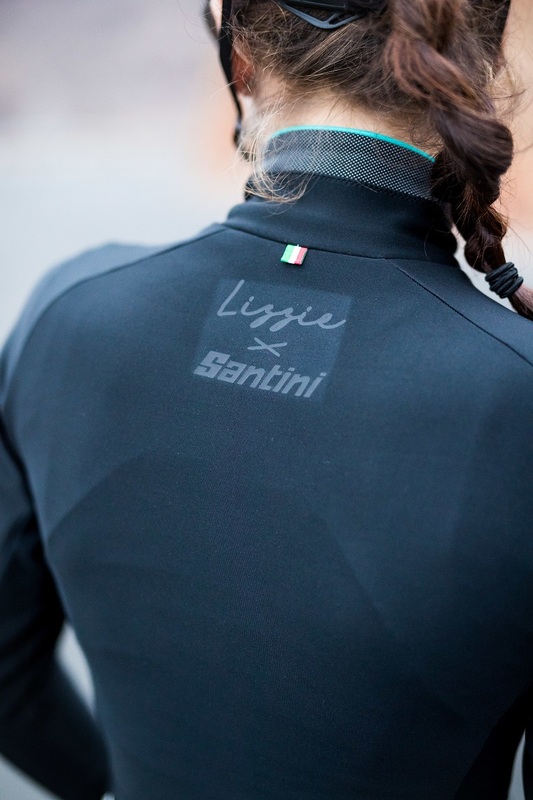 Santini ambassador and cycling superwoman Lizzie Deignan launches her new Lizzie X Santini signature collection with a selection of women’s winter apparel. Elizabeth “Lizzie” Deignan (née Armitstead) is one of the most accomplished athletes in cycling. She a former UCI Road World Champion, Commonwealth Champion, five-time British National Champion, Olympic Road Race Silver Medalist, and twice winner of the UCI Women's Road World Cup. Prior to her switch to road racing, the 29-year old English cyclist also won five medals at the UCI Track World Championships. Lizzie is also an accomplished business woman, spokesperson, and expecting first-time mother! PASSO winter jacket - Built with Windstopper fabric (300 GR/M2), Lizzie’s PASSO jacket for women is designed for temperatures as low as 5 degrees Celsius, as well as offers protection from wind and rain. The PASSO is performance fit and features inserts in reflective pixel fabric on the neck and cuffs and offers two zippered rear pockets. 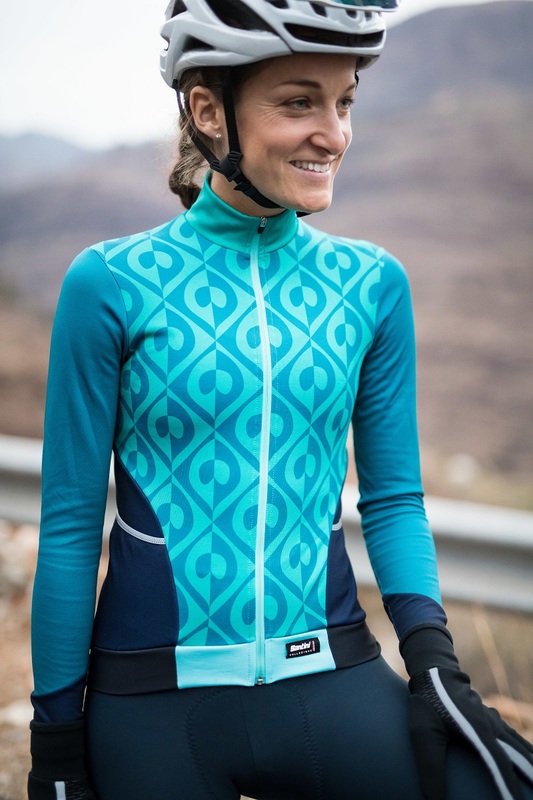 Lizzie recommends the PASSO for cold winter rides with only a thermal base layer underneath. CORAL long-sleeve jerseys - Made of soft and warm thermofleece Lite Pro, the CORAL jersey is easy to wear, comfortable, and warm. Available in three colors, CORAL features sleeve cuffs in double thermofleece, five large pockets, and reflective trim to ensure maximum visibility on the road. The design features a stylized peacock pattern, the signature graphic element in Lizzie’s collection. 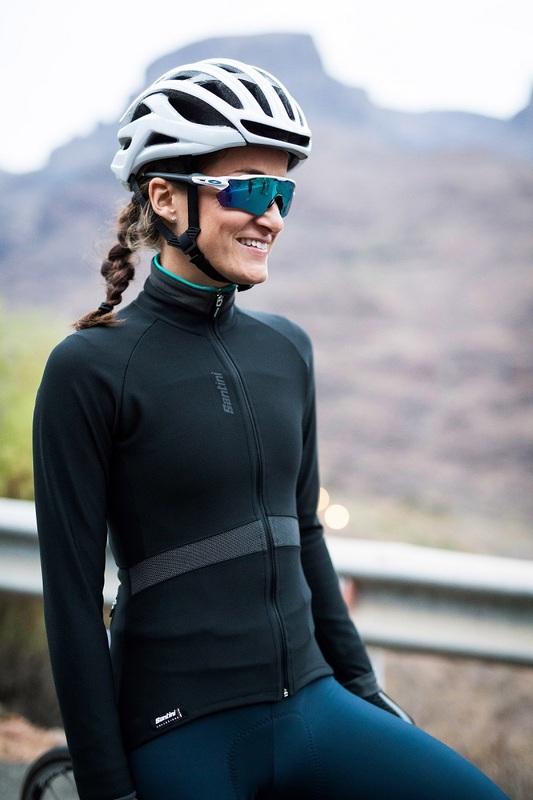 Lizzie says use this thermal jersey with a base layer with temperatures between 15° and 20°, or with her CORAL jacket on top to face colder weather and rainy conditions. CORAL bib tights - Train all winter with Lizzie’s CORAL bib-tights! Made of warm and soft thermofleece, the upper brace is designed with an innovative mesh bib to ensure perfect fit and maximum breathability. Our women’s–specific GIL2 chamois with anti-shock gel core maximizes comfort in the saddle. The collection also includes a packable winter jacket (SCUDO) and a mid-winter jacket (CORAL), and is designed to mix and match with all of Santini’s core winter accessories. Lizzie Deignan is signed to the Trek Factory Team in 2019. She is married to professional cyclist Philip Deignan. The Lizzie X Santini collection winter items are available now.